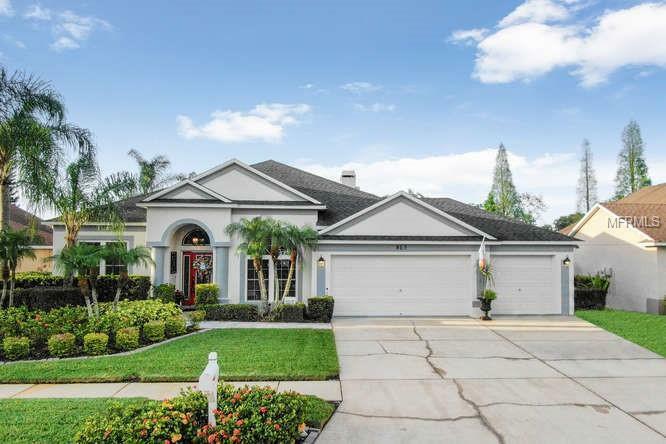 *** Multiple Offers highest and best by 5pm 4/14/19***Bring your boat ski's and fishing rods to this stunning 2442 sq ft lakefront home that boasts 4 bedrooms 3 baths and a 3 car garage located on beautiful Lake Mango! This gorgeous open/split floor plan has a large eat-in kitchen with plenty of counter & cabinet space and includes a wine fridge. The family room opens up into the large covered lanai that boasts amazing sunset lake views and your own tropical gas heated pebble-tech finished spa & saltwater pool with spill over featuring fiber optic lighting. There is also a private dock w/boat lift and a sundeck to sunbathe on. Fish for bass directly from your own backyard! This home features many upgrades such as weather tight windows and doors installed in 2014 phantom screen doors Stainless Steel appliances Travertine Maple wood floors Granite Counter tops and a wood burning fireplace with a custom mantel. Speakers are wired throughout this magnificent home. Bathrooms have been upgraded to seamless glass enclosures. Roof was replaced in 2012. Owners have spared no expense with many more upgrades and personal touches. The home is located nearby the Brandon Westfield Mall with easy access to both I-74 and I-4 and minutes from local shopping and dining. This is" Florida living" at it's finest at a very affordable price! A must see Don't miss out! !